Nursing and healthcare is changing in response to an ageing population. There is a renewed need for holistic nursing to provide clinically competent, appropriate and timely care for patients who may present with inextricably linked mental and physical health requirements. 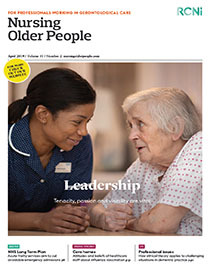 This article explores the dichotomy in healthcare provision for ‘physical’ and ‘mental’ health, and the unique role nurses have when caring for people with delirium superimposed on dementia (DSD). Delirium is prevalent in older people and recognised as ‘acute brain failure’. As an acute change in cognition, it presents a unique challenge when occurring in a person with dementia and poses a significant risk of mortality. In this article, dementia is contrasted with delirium and subtypes of delirium presentation are discussed. Nurses can recognise DSD through history gathering, implementation of appropriate care and effective communication with families and the multidisciplinary team. A simple mnemonic called PINCH ME (Pain, INfection, Constipation, deHydration, Medication, Environment) can help identify potential underlying causes of DSD and considerations for care planning. The mnemonic can easily be adapted to different clinical settings and a fictitious scenario is presented to show its application in practice.